Welcome to my home in Bellosguardo, in the characteristic area of S. Frediano, a few steps from S. Spirito, Palazzo Pitti and Boboli Gardens. You are in the hearts of the city but away from the hustle and bustle, in an oasis of quiet and charm overlooking the most beautiful view of Florence. The house, very spacious with 6 beds, has a reserved parking space and a garden. 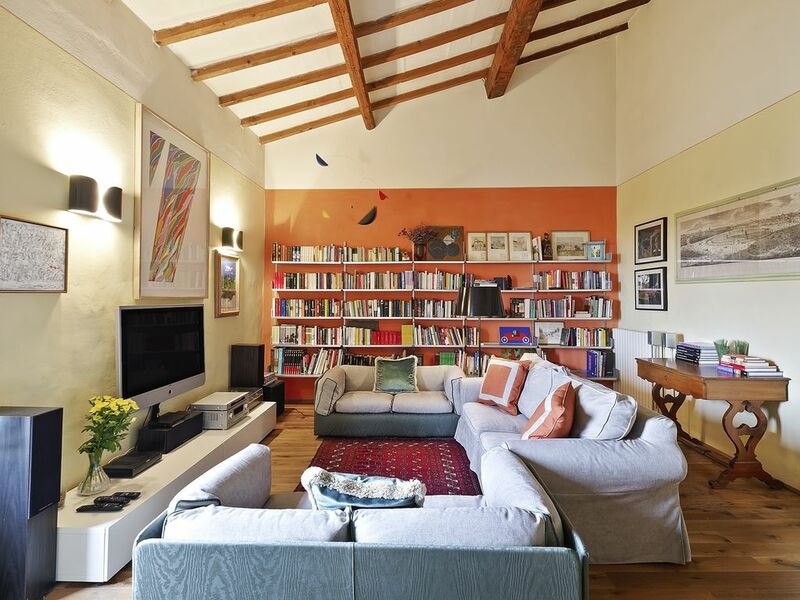 Bellosguardo is the ideal base for visiting Florence, 15 minutes walk and you are already in the heart of the city, between Piazza del Carmine, Palazzo Pitti and Ponte Vecchio. All the bedrooms, the living room and the dining room offer a magnificent view over the whole city. On the ground floor, after three steps, there is a large entrance/living room where there is a double sofa bed and a bathroom with the shower. On the mezzanine floor there is a large living room with sofas and armchairs, a dining room with a table for 10 people, a study and a fully equipped kitchen. In the sleeping area you will find a large corridor leading to two bedrooms: the first has a double bed and the second has two single beds that can be joined into a double bed on request. The double bedroom also has a private bathroom with a bath. In the corridor there is another bathroom with a shower. All the beds are made with fresh luxury linens, what more do you need for a good night’s sleep? You don’t have to live out of your suitcase; plenty of storage room means you can get unpacking and start feeling at home right away. The apartment also has a private garden and a reserved parking space for our guests! Freshen up in one of the lovely bathrooms - enjoy a soak in the large tub or wake up in the mornings with the fantastic shower. White fluffy towels and shampoo are provided! If cooking is your thing, you’re going to love spending time in the stylish kitchen. All the appliances are modern and easy to use - you’ll enjoy showing off your culinary skills here! My property will be professionally cleaned before your stay. My friends at Hostmaker are looking after my home while I am away; they are management service team who know Florence like the back of their hand! I trust them to look after you and give you a warm welcome! If you have any questions about your stay, please get in touch through the dedicated platform. Thank you for your interests in my apartment. - Late check-in fee of € 20 for arrivals after 10.00pm to be paid at check-in preferably by credit card or otherwise cash. - Please respect the house and the people who live in the building. - Additional cleaning and linens services available for a fee and on request. - According to Italian laws: The flat is duly licensed as Home Holidays. Florence € 3 tourist tax applied per person per night for the first 7 nights. Children up to 12 years old are exempt. To be paid at check-in preferably by credit card or otherwise cash. - Guests will be required to present valid IDs at the time of check-in for registration to the Italian security authorities. - For long term rentals (over 30 consecutive nights), guests will be asked to sign a rental agreement that will be made available via email before arrival. For any question please don’t hesitate to ask. We look forward to welcoming you in Florence! San Frediano is located in the Oltrarno neighbourhood, in the part of Florence that lies on the left bank of the river Arno. The area is characterized by the great gate of medieval origin, which still retains its original wooden door. The name of the district derives from the church of San Frediano, dating from the tenth century, which dominates Piazza di Cestello. In the area lies the Church of Santa Maria del Carmine, especially known for the Cappella Brancacci. Inside you can admire the famous frescoes by Masaccio and Masolino, some of the most important examples of Renaissance art.